Here is an update on our drone project looking at how human activities may affect the distribution of marine megafauna such as sea turtles, sharks, and rays (see here and here for previous posts). So far, we have seen more marine wildlife in non-developed areas with just minutes of aerial footage. For more detail on our latest data, please read more below and enjoy this short clip of a couple of clips from two of our surveys. 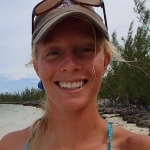 My name is Stephanie, and I am an undergraduate researcher analyzing drone videos on this project. Recently, I’ve been analyzing videos from the pairings between Snake Cay (non-developed) and Cherokee (human developed). I have also spent time looking at Hills Creek (non-developed) and Treasure Cay (human developed) locational pairing. These locational pairings were created in an effort to pair locations in close proximity to one another in an attempt to eliminate additional variables (see Stoner et al. 2011 for more details). For each site, two drone surveys were conducted, covering an area of approximately 4-6 hectares in ~ 20 minutes of footage. While analyzing the drone footage, I am recording all marine megafauna species and the number seen throughout the video. Thus far, statistics have not been used when looking at the findings since there are many more videos to go through and different variables to account for, but so far, this is what I’ve found. When comparing Snake Cay and Cherokee, Snake Cay averages 0.53 marine megafauna per minute of video, whereas Cherokee averages 0.02 marine megafauna per minute of video. The data leads us to believe that more marine megafauna are present at Snake Cay, a less human developed area when compared to Cherokee. Similar results were found when comparing Hills Creek and Treasure Cay. At Hills Creek, an average of 1.22 marine megafauna were found per minute of video, whereas at Treasure Cay only 0.47 marine megafauna were identified per minute of video. We hypothesized human development to correlate with a lower abundance of marine megafauna species because a developed shoreline causes more disturbances in the marine megafauna’s habitat through decreased suitable habitat due to habitat destruction, run off, and increased noise and traffic by boats. Doing this preliminary study will help to determine the magnitude of impact human development along the coasts of Abaco can have on the marine megafauna living in the area and their distribution. Stay tuned for updates and further findings in the coming weeks!